Request post, clip on or both here. 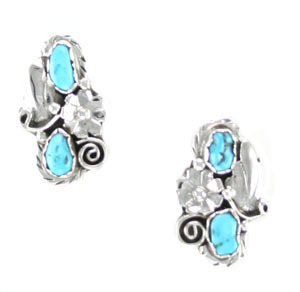 Navajo crafted, sterling silver, two freeform turquoise stones and a cast leaf and flower cup post earring. Measures approximately 1" long by 1/2" wide but will vary some. Stone size and shape will vary. Available clip on or post. Choose style when ordering.